Aviation of Japan 日本の航空史: "Dinah with the Finah Linah"
When the Airfix Ki-46 first appeared in 1965 it seemed an exotic choice for this most British of model makers. The Airfix Aichi D3A1 'Val' had been released the year before, in 1964, so perhaps the Nakajima B5N 'Kate' might have been a more expected stablemate. However, 'Dinah' had attracted the attention and admiration of the wartime RAF and a rare surviving example existed in England. A little surprising then that Airfix chose to represent the Ki-46-II rather than the even more streamlined Ki-46-III survivor. The kit was cleanly molded in light grey plastic and captured the overall shape and lines of the original very well indeed. Markings for a single option, from the unidentified (by Airfix) 18th Dokuritsu Hiko Chutai (DHC - Independent Flying or Flight Squadron), were included. The Hinomaru were in the usual bright and unsaturated Airfix printers vermilion and the "Tiger on the Tail" bore more than a passing resemblance to the leaping tiger depicted in the then current Esso Petrol advertising"Put a Tiger in Your Tank". Painting instructions called for overall Matt Light Grey with red spinners and the memorable box art depicted an almost off-white Dinah attempting to take off from a smoke-palled tropical airfield under attack by Corsairs. This box art was duplicated, albeit in a truncated version, by the Airfix 'Craft Master' version of the kit marketed in the USA by MPC. This version was molded in a rather brittle silver plastic. Problems with the kit, disregarding the raised surface detail, are the poorly shaped spinners, crude "flanged" cowling flaps and stalky, simplistic undercarriage. There were no separate engines and the "engine" detail molded within the cowlings is crude. Unusually for the time a basic interior was featured which included an instrument panel, control column, bulkheads and seats. Cameras were molded to the underside of the cockpit floor and could be viewed through transparencies. All very commendable for the time. The Airfix kit may be further improved by using the Aeroclub/Airwaves photo-etch detail set specifically designed for it and available from Hannants. The LS (now Arii) series of Ki-46 kits (of which more anon) was also issued in the mid-1960's but I am not sure whether it was before or after the Airfix kit. I don't recall seeing them until much later and the earliest boxing I have displays the "Japan Safety Toy" mark which I think was introduced in the late sixties (?). In addition to the Ki-46-II and Ki-46-III early production, LS issued a kit of the Ki-46-III Otsu interceptor and the Ki-46-II Kai trainer. Some compromise in details resulted from the use of common parts to all the kits. The LS series are beautiful kits, with fine engraved detail. The representation of the fabric covered control surfaces is superb if exaggerated. Some have suggested that these kits are slightly under-scale, being to the 1/75th scale of earlier LS offerings, but in fact they match up well to 1/72nd scale plans. 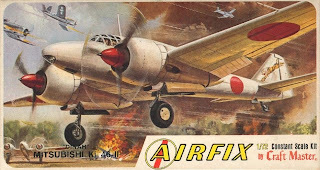 The Airfix kit was re-issued with new box art and "new" flash in 1979 (the box is marked as © 1978) and this time two markings options were offered, for the 76th DHC based in the East Indies in 1943 and the 81st Sentai 2nd Chutai in Malaya during 1942. The box art depicted the 76th DHC Dinah, with a unique anti-glare panel, being pursued by a couple of Wildcats. Painting instructions gave this as overall Light Aircraft Grey (M13 in the original Airfix paints collection) with Brick Red (M1) spinners and Deep Cream (M15) wing leading edge ID strips. The box art showed a pretty decent dark reddish brown for the spinners. Interestingly the 81st Sentai option was given as being Duck Egg Blue (M8) overall, perhaps a fair out of the tin representation of the pale blue-green JAAF paint colour # 1 Hairyokushoku (ash green colour). 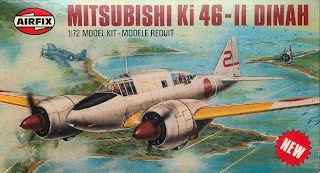 The last re-issue of the Airfix kit, in 1994, displayed box art changed once more to depict a brown aircraft of the 81st Sentai 1st Chutai over Malaya in 1942. An alternative option returned to a tiger-adorned machine of the 18th DHC but this time the tiger was closer to the JAAF originals in appearance. The unusual brown choice was called out as Humbrol Matt 160 German Camouflage Red Brown with Matt 28 Camouflage Grey undersurfaces, whilst the 18th DHC example was called out as Matt 28 overall. The decal sheet included for the first time an instrument panel decal depicted, also unusually, as red brown! Images of the decal sheets and additional comments are here. This Airfix classic was to be re-issued once more by Hornby in 2013 as covered here. The colours of Dinah have always been a subject of some conjecture and most recently the case has been made, based on the evidence of relics and at least one colour photograph, that they appear to have been factory painted in a similar "olive gray" to the Mitsubishi-built Zero. One of the issues in identifying this colour is that when exposed it often developed a blueish-grey "chalking" which means that contemporaneous descriptions of grey or blue-grey Dinahs may not have been what they seemed. "The general appearance of the aircraft was quite new, probably not having flown more than 30 hours. The Dinah was of grey painted metal, the tail assembly and ailerons were covered in grey fabric . . ."
Strike one for Airfix. This does not sound like the grey chalking of exposed "olive-gray" paint. Another Dinah had been brought down by the Spitfires of 54 Sqn near Darwin on the 6th February 1943 and the combat report described the aircraft as being "coloured a greyish blue". Combat reports from the Burma theatre also describe grey, blue-grey, pale green and even "beautiful pale blue" paintwork. A contemporaneous Japanese painting of a 18th DHC Ki-46-II in flight shows a strikingly bluish looking grey similar to FS 36320. As a strategic, high-flying recce twin a blue-grey paint scheme would seem appropriate. Another issue is that JAAF # 7 paint colour Ohryoku Nana Go Shoku (Yellow Green No.7 Colour), an olive brown shade like British khaki drab, begins to approach the "olive gray" colour in appearance when severely faded and bleached by exposure. Also the JAAF # 30 paint colour Karekusa Iro (Parched or Dried Grass Colour), often applied in a camouflage pattern to the upper surfaces, is somewhat similar to the "olive gray". Therefore it is not absolutely conclusive that the "olive gray" represents an overall factory finish on these aircraft or that it is an identical "olive gray" as found on Zero relics. The effect of the tropical sun and climate on the cellulose based paints of the 1940's should not be underestimated. Not having examined the original Airfix paints the closeness or otherwise of the matches cannot be verified. I will be posting additional information about mixes to represent the pale blue-green Army Hairyokushoku in due course. Addendum: Since this blog post was written, further information about the Ki-46 "olive grey" factory colour scheme has been posted here. Please post scans of the decal sheets from the last two issues of the Airfix Dinah kit. Thanks a lot. 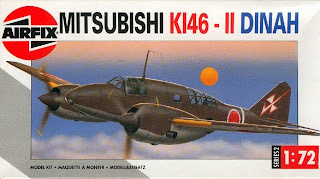 The Airfix Dinah kit's 1994 issue box art and decals were new to me. In a previous post, you mentioned your preference of the Airfix (and LS?) kit over the recent Hasegawa Dinahs. Could you please post a comparative article, weighing the pros and cons of both (Airfix and Hasegawa)? Thanks in advance. Since yesterday evening I now have my own 3rd and 4th issue Airfix Dinah kit boxings to hand. The 1994 issue's box art has a topside color with a dark brown near to Munsell 10 R 3/2. This may/may not be the closest standard Munsell chip match, just the closest I have. I wonder what prompted the use of such a dark red brown in the box art image?